^This offer includes the supplemental benefits as described in the Terms & Conditions which you can cancel at any time with customer care. 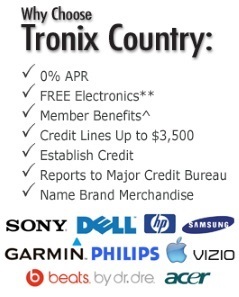 Tronix Country, through NCD Financial, LLC, guarantees your approval if you meet the requirements as defined in the Terms & Conditions and can prove that you have a combined household income of over $1,000 a month, have a valid US checking or credit card account, have the ability to make a monthly payment of as much as $199 if the entire credit line is utilized, are over 18 years of age (18-20 requires co-signer), have proof of income for a minimum of six consecutive months, can provide proper proof of identity (which may include a utility bill and/or government issued ID) and have paid the necessary fees for enrollment without going into default. For products that exceed your credit limit, a down payment from twenty to forty percent maybe required before any products are shipped or other services provided. Any promotional free merchandise or discounts are subject to your Account Terms & Conditions and/or Reward Point Terms and your Account not going into Default and is paid. All new Accounts are enrolled in our exclusive Member Benefits program, which includes: discounted family legal care, ID theft restoration service, roadside assistance in selected states, prescription savings, travel & automotive discounts, and unlimited tech support.^* After your first month of $29.99 or initial free trial (depending on the offer), your Member Benefit Services will continue at the rate of $14.95 a month, which can be cancelled by calling Customer Service at (703) 321-2106.